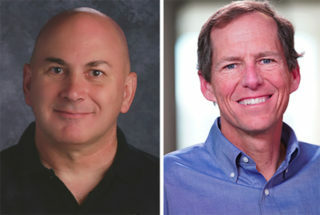 California teachers Bruce Aster and Darren Miller said they would stay with their local union but break away from the state and national affiliates if given the chance. The Supreme Court’s pending decision in the Janus case has the potential to decimate the clout and size of public-sector unions by allowing members who disagree with the union’s activity to opt out of membership. But another path to maintaining membership in local unions may be emerging: a split from the more divisive and politically charged state and national affiliates that turn off many of those disaffected members. Local unions in Florida, Tennessee, and Indiana have split with state and national affiliates in recent years. The most notable break came earlier this year in Nevada, where teachers in metro Las Vegas broke from the Nevada State Education Association and the National Education Association in late April after questioning how their $6 million in annual dues were being spent. The group has assisted about a dozen local groups across the country to learn more about dissolving their association with state and national groups, he said, including referring them to local attorneys to help with the process. In the pending Supreme Court case, Illinois child support specialist Mark Janus argues that he shouldn’t have to pay the “agency fees” that fund contract negotiations and similar union activities, because public-sector employment issues are inherently political. Dissenting employees have been able to opt out of supporting political activities since the 1970s; unions say the agency, or fair-share, fees are necessary to prevent free riders from benefiting from the higher salaries and superior benefits they negotiate on workers’ behalf. Teachers unions also provide liability insurance to members and represent them in disciplinary proceedings. A decision is due before the end of the court’s term in June; most court watchers expect the justices to side with Janus and end mandatory dues. Representatives of the NEA and the American Federation of Teachers, the country’s two largest teachers unions, did not respond to requests for comment, though NEA President Lily Eskelsen García addressed Janus’s potential impact at a recent conference. At least some of those most opposed to mandatory dues — plaintiffs in a separate lawsuit also challenging required fees — said they’d be happy to pay them if their local affiliate broke away from state and national groups. The California educators, with lead plaintiff Ryan Yohn, make the same First Amendment arguments as those in the Janus case, and also contend that the current opt-out process for dissenting members is too difficult and that educators should instead have to opt into union membership. A number of teachers in plaintiff Bruce Aster’s Carlsbad, California, school district will opt out of union membership if Janus is decided against the unions, he said, but not because they don’t like the local. “It’s the CTA [California Teachers Association], NEA connection that’s the big bugaboo,” he said. Leaving state and national affiliates could mean lower dues and better contract outcomes, said Darren Miller, a high school math teacher in suburban Sacramento, also a plaintiff in the Yohn lawsuit. “We could hire the best labor-law attorney firm … as opposed to having marginally trained teachers up against district accountants and attorneys. I think disaffiliation would be a net benefit for teachers,” he said. About 90,000 of the NEA’s 3 million members are currently agency-fee-only payers, García, the president, said in mid-May during a panel on Janus at the Education Writers Association national conference. She said the NEA believes the right-to-work advocates pressing the case are looking not only to stop the required fees but to diminish labor unions in size and influence. The group is focused on winning over members and potential members primarily through one-on-one conversations, she added. Lee Adler, a professor at Cornell University’s School of Industrial and Labor Relations, said he doesn’t think disaffiliating is a good strategy to maintain membership, at least in the short term, because it would be difficult to immediately remove the political stigma some members associate with the national unions, and locals would lose the expertise of state and national union staff. Unions instead should work to explain to members how they separate political and non-political dues, he said. Local affiliates can look to the 28 right-to-work states where teachers and other public employees already don’t have to pay dues, but many educators choose to join unions, Adler suggested. “For local schoolteacher unions to go back to the drawing board and internally reorganize … that will make them more attractive, irrespective of whatever the policies of national unions are,” he said. State and national unions should also pay attention to recent teacher strikes in Oklahoma, West Virginia, and Arizona, Adler said. Many of those efforts started at the grassroots level away from state-level unions, built alliances with others in education, and have focused on educational issues more broadly, beyond just teacher salary. “It’s a much more ecumenical approach than is traditionally associated with educational unions, and that’s what makes it so fascinating and potentially attractive to even the folks that don’t want to pay dues,” he said. Should local chapters decide to break ties from state and national affiliates, the exact process may either be disaffiliating the local chapter or decertifying the affiliated group and re-forming a new local union, depending on the individual chapter’s bylaws, Sharkey, of the Association of American Educators, said. Ed Dawson, an attorney in Washington state, has helped one or two local unions in the eastern part of the state disaffiliate from the Washington Education Association for each of the past five years. Before becoming an attorney, he was a teacher for two decades. He disagreed with the union, particularly its support for Planned Parenthood, he said, and filed a religious exemption, donating to a local nonprofit dance company rather than pay dues. Thirty percent of a local union must sign a card expressing their interest in disaffiliating from the WEA. Those are then taken to the state Public Employement Relations Commission, which orders an election. If more than half of employees decertify the WEA, they can then find a new bargaining agent or form their own, Dawson explained. The pace of disaffiliations has slowed dramatically in the past six months to a year in the shadow of the Janus case, he said, as people believe a decision allowing them to opt out of dues will sever their affiliation with the state union. What union dissenters don’t realize, though, is that even if they don’t have to pay fair-share fees to the Washington Education Association, they won’t be rid of the union’s influence, Dawson said. Most states require unions to represent all employees, even non-members, so dissenters would be bound by the salaries, working conditions, and benefits the unions negotiate on their behalf. “What they don’t realize is that even if the Janus decision is favorable as far as we’re concerned, the Washington Education Association will still be the bargaining agent,” he said.